I really did not know what to expect with this challenge. Apple butter? Never heard of it! 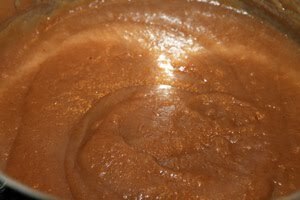 Apple sauce yes, know about that one, but apple butter? OK, lets give it a go and stick it in a jar and preserve it. I think the most challenging part of this challenge was grating 2kgs of apples and not grating my finger off. I have to admit that the task did get tedious after a while and the apples, not at all happy with being left in the open air, soon started to go brown in protest. But all was not lost. 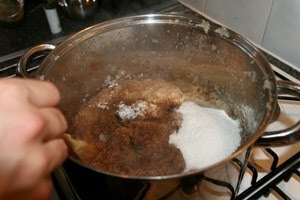 Once it got cooking and started to break down into a delicious slushy mess who was to know about the creeping sneaky brownness. In about an hour the appley, watery mess had come together and embraced all the spice and cooking and become a thing of beauty. 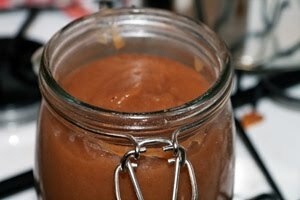 Delicious smelling, divine tasting, and devastatingly simple apple butter. Into my sterilised jar and it is now on standby ready to adorn a bagel, strudel, pie, or whatever I choose to dollop it on. Yield: About 4 to 5 half-pint jars. 1. Wash and rinse canning jars; keep hot until ready to fill. Prepare lids and screw bands according to manufacturer’s directions. 2. Wash apples well and peel. 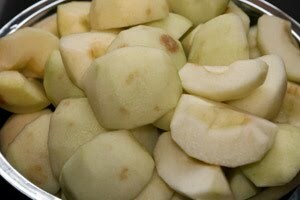 Cut apples into quarters or eighths and remove cores. 3. Combine unpeeled apples and cider in big saucepan. Cook slowly and stir occasionally to prevent sticking. Cook until apples are very soft (falling apart). 5. 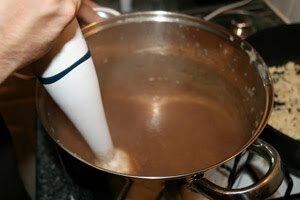 Combine pulp with sugar and spices in large saucepan. Simmer over low heat, stirring frequently. 6. To test for doneness, spoon a small quantity onto a clean plate; when the butter mounds on the plate without liquid separating around the edge of the butter, it is ready for processing. 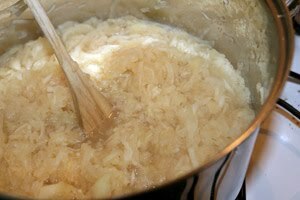 Another way to test for doneness is to remove a spoonful of the cooked butter on a spoon and hold it away from steam for 2 minutes. It is done if the butter remains mounded on the spoon.